First let me say that this was the first press screening I've ever gone to, so I was pretty stoked, and it really show's how fast Quiet Earth is growing. Ok, segway into the review. Thomas McCarthy did the Station Agent, a film which was so critically acclaimed, not to mention downright good, I couldn't help but be excited to see this. Variety called this a "possibly indy hit of the year" not 2 days ago. Wow, too much buildup? Yes. Would it have mattered? No. The Visitor was nowhere near as engaging as his first film, in fact I can't get past comparison between the two. While this had it's awkwardly funny points, it was just too heavy handed, too formal, unlike the first which was serious in nature, but seemed more capricious in it's character interplay. To put it more aptly, it was far too gentrified for my taste, and now that I think of it, it felt nothing like it's setting of New York. It completely lost that whole touch, granted that may have just been a backdrop for the cultural convenience. While not bad, I didn't enjoy it, so I wouldn't recommend it. If you must, wait for the DVD. That said, there's spoilers ahead. The story revolves around a widowed professor who we gather has a pretty drab life. This is accomplished via many lonely shots at the beginning of the film. He tries learning the piano, but he's gone through four teachers. He stares off into the distance and drinks lots of wine. This really didn't set the pace for me, it lacked depth, but we still know what they're getting at. He is then asked to go to Manhattan to deliver a speech on a paper he co-authored, he refuses but ends up having to go anyways. He does have a little used apartment there, and after walking in discovers a muslim couple living there who quickly realize they got swindled, but he invites them to stay anyways. Now the point of the whole film is that through his friendship with this muslim couple and the drumming he also learns from the husband, Tarek, he finds his way back to life. The story goes on quite a bit further then this, but you can guess since Tarek is Arab, some tragedy befalls him and the film takes on what you might call "political overtones". 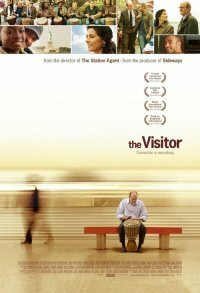 This is where I think The Visitor might be pulling in the great reviews, but it doesn't sucker me. It's just way too subdued. Another thing, why is the Professor riding the subway when he's obviously got money? That guy would be taking a cab, I guarantee it. All in all, I didn't care for it. Don't get me wrong, I still love Thomas McCarthy, but I think he works better with characters more aberrant in nature. I used to live in New York and cab fare could easily eat up your money, plus it's not always easy to find a cab, especially during the shift change. I used to walk as much as possible, take the subway for long distances, and grab a cab if I saw one and I was in a rush. Me too, but really, this guy was obviously very well off, and he's using the subway like it's no thang.